Ok...so that is a bit dramatic. But really, I am not exaggerating. But, a second math component that I talk about occasionally, but really has just as much impact on my math teaching is my spiral math homework. I literally could not live without it. Let me tell you why I love these two pieces of my math block puzzle. You see, these both take care of those rote standards that I need my kids to know, yet they just don't seem to grasp from that one lesson I teach that one day of the school year. Things like place value (have you ever tried to get the kids to remember to write expanded form in March???? ), plotting on number lines, or general multiplication and division. These are skills the kids MUST know, yet don't get nearly enough practice in the traditional way of doing things. But with Spiral Math and Calendar Math, they not only get more practice, but they get DAILY practice! The homework is 10 problems a day, not of what we just learned, but of EVERYTHING that we learned. The kids were constantly seeing the same style problem over and over and over. Their skills were always being refreshed....and it works like MAGIC! Because nothing is being forgotten, the kids are always practicing those basic skills they need, nothing is ever lost. I can honestly say that because of this homework and Calendar if I don't get to a lesson in math that day...I STILL FEEL OK! I know all of the standards are covered and I simply DO NOT EVER stress about math. Ever. Doing homework and Calendar in this daily, repetitive way has freed up all that time I used to use for rote skill to work with models, explore concepts, and get really deep into CCSS! I get the kids thinking about math processes, instead of always worrying about the rote memory of it all. It really is amazing what one little 10 problem page can do and one math warm up (that takes all of 10 minutes). However, doing the work isn't enough. The key to this is that every.single.day, without fail, we go over the homework AND Calendar. I have it worked into my math block (just 10 minutes each) to go over the problems. I don't teach during this time, I just show the students how to do the work, with their help at times, on the ELMO and then they take it home to study for later. This review of the problems is what makes this homework and Calendar better than anything I have done before. If the kids didn't get it at home the night before, they get it when we go over it. Then, when they see a similar problem on a homework that week (or the next or the next) they *do* get it. Really, this is the MOST meaningful time of my day. It makes math a stressfree zone in my room. The kids like it, they benefit from the repeated practice, and I am a happy teacher because of it. Do you do any sort of spiral math or daily calendar math? Tell us about it! I currently do a daily math warm up with 2 problems a day that spiral skills. I think this is what I need to keep my kids practicing at home. I usually assign a workbook page to go with my daily lesson but I feel like they are just going through the motions and not getting a real grasp on why they are doing what they are doing. This may be just what I need!! What a fantastic idea! In my district we are required to do a "do now" every day. I had been using a consumable workbook called "Heads Up" but it really isn't working for me. I'd love to try out your math calendar! I teach 5th currently. Either way, this is totally going on my wishlist! I've done spiral review before and it's worked well. But I haven't had a chance to update it to match common core. I teach 4th grade. Do you have an email Lyn? Do you have an email Patricia? Just wondering - haven't seen anything in inbox or spam, though. We have a spiral section in our math book, but I would love to do more- during morning "Get Ready" time. Is it possible to have a week of all three grades? I teach SPED K-8 (many times with multiple grade levels at the same time) and I would love to see if I could work this in! I sent 4th grade for now. Let me know how that one goes for you. I teach 5th grade and this is my first year ever teaching math. (We were on a block schedule before.) Our district uses Everyday Math, which I have very mixed feelings about. I like that it spirals, but a lot of time the material within the units feel disconnected. I would love to use a more consistent Calendar math and homework system that incorporated more practice, which EDM greatly lacks. Love your resources! I just had a new colleague observe me teach math yesterday and she was amazed that a) my kids could DO this math and do it well and b) how engaged and interactive the kids were. Thank you so much for letting me know Raye! I love hearing about successes in other classrooms with Calendar and Spiral Math. You have definitely filled my bucket tonight! I have several of your products and love them all. I really would like to incorporate calendar math in my multi-age classroom. I just don't know where to start. I would truly appreciate either the 4th or 5th grade version to see how to get started. Thank you for sharing! I love the idea of spiral math! Currently I do a daily 5-question powerpoint and the kids answer the questions on whiteboards at their seats. Having something that is bound and handwritten that can be worked on with me or a tutor later for kids who need more one-on-one practice would be terrific to try though! Thank you for this! This looks great! My students in 5th grade need all of the extra practice that they can get and this is a great way that I am looking forward to implementing for my students. I am in a new grade level this year, fourth, and trying to figure it all out. I think this would be a huge asset to what I am doing. I would love to try your fourth grade set/s. Thanks so much! I am in fourth grade and could use all the help I can get. Thank you for your offer to try your program. I am an Elementary Math Specialist and love giving my teachers new and EFFICIENT strategies for making the most of their math block! Please share! Thank you!! I would love to try this! I use a few spiral activities, but my students aren't doing as well as I would like. I teach 5th grade. I teach 4th grade. We use Everyday Math which has a spiral. I would love to see how your products could fit with it for some continued work. I use Everyday Math too but I like this product because it spirals more consistently. Ugh...I just typed up a bunch of stuff, but apparently I wasn't signed in. Now that I am, it is all gone. Ugh. I'm 4th grade and I'm hoping to give it another try this weekend - the set-up that is. I am using your Calendar Math in my fifth grade classroom and would love to try this resource. My email is scable@lutieschool.com. Thanks in advance! I have everyone up to here. Check your email! I would love to try your Spiral/Calendar Math! I teach an inclusion 4th grade class. We use Engage NY. I would love to try out the Spiral/Calendar math. Spiral review is so important! Constant repetition in a fun way sounds great for my class. May I have year 5 please? I teach a multi-age 3/4 grade class. This year I have been using your calendar math for fourth grade with both groups. It is a stretch for some thirds, but it is all good practice and exposure. I have been creating my own spiral math homework of sorts, but would love to look at yours more closely. Both grades have been on my wish list. Thanks for your wonderful products! I teach 5th and am interested because I love spending my time in class on in-depth, multi-step problems that will align with our testing. Also, many of my parent have difficulty helping their child with homework because what we do is so different from math from when they were kids! Thanks for creating this opportunity! This is just the jump I need to make. Can you forward 5th to wkalwarczyk@yahoo.com. Thanks so much. I've just started to use the numerical form of the date this year as a bit of a warm-up. Years ago, I used to have kids make up math questions to go with their birthdate that their classmates would solve on the student's birthday. This idea probably came from the old Learning magazines of the 90's! Anyway, we need new ideas for warm-ups. The Gr. 6 teachers are complaining that some of our kids can't even distinguish between even and odd numbers so I'm throwing every example of even/odd their way, even in gym! I teach Gr. 5 near Toronto. My e-mail is: skelding@rogers.com. Thanks, Stephanie! I have all 4/5 up to here. I do use a spiral review in as a center rotation, not on a nightly basis. I do like that thought. It is good to use the spiral method because it gives you time to address any 'holes' throughout the year and not have a complete reteach in the spring. I would like to try your 4th grade spiral math. I co-teach in a multi-age classroom. A daily spiral practice is exactly what we are missing. I would love to try this product. I have everyone up until here! I would love to try this with my 5th graders! I also use Calendar Math daily and that daily repetition of skills does make a difference. I would love to try the spiral and calendar math! I do daily spiral review, but I didn't know upper grades can do the calendar math. Thanks for sharing! I would love to try the 4th grade spiral review because I havn't worked any common core review in yet! I teach 2 sections of 5th grade math. I would love to try out this spiraling! I would like a sample of this for my 5th graders. Our new CC math program has no homework. I definitely feel that homework most days is necessary for my students to get more practice. I usually just write up a worksheet reviewing the day's lesson. I love the idea of spiraling homework questions so students get additional practice on those standards and skills not yet mastered. I'd love to get a copy of some of these for grade 3. Hope it's not too late...I love how this re-emphasizes strong points. My 5th grade students will enjoy this very much. I would love a copy of the available fifth grade materials. The comments on here are so encouraging and inspiring! jlapinski@hotmail.com Thanks!!! Hi Stephanie! I teach 6th grade math and some of my students are lacking those critical skills from 5th grade. I think your spiral math and calendar math are awesome resources to build-up those lacking skills. I would love a copy of your 5th grade math materials. I currently use your 5th Grade Spiral Math and love it. I was thinking of beginning the calendar math after Christmas break or should I wait till fall? You can definitely do it immediately when you get back! It really is a great tool to use at any time of year. I'm a first year teacher and am struggling to cover all the 5th grade standards in depth. I would love to give this a try! Jessccastle@gmail.com. Thanks! I teach math to all of the 4th graders in my building. I would love to try spiral math with my classes. I love your blog post!!! I teach at a 1:1 school and I feel spiral is so vital! It is one part of my math instruction that I feel is missing!! I am glad I stumbled upon your blog!! I have enjoyed the posts you have shared. I wish our sons current teacher did Spiral Math with her class.I am currently a stay at home mom working on my BA towards Education and part-time homeschooling. After looking at your Spiral Math samples I know this is something I plan on using once I am finished with my degree and have a class of my own. Our oldest is in 4th grade but we have him doing 5th grade math and since we are challenging him to the 5th grade math on our own we don't have his teacher to turn to for assistance. If you could share your 5th grade Spiral Math with me I would be so grateful. I am currently using your 5th Grade Calendar Math set with a few tweaks of my own... It has been awesome in that it continues to review those tough concepts. However, how do you get your lower students to "buy in" to completing the work? This is where I struggle. I also feel that I do not have time to thoroughly go through the problems like we should every day. How long is your Math Block? I would love to hear more about your classroom. I would also like to view the Spiral Math. I think this is something that could really benefit us! Thanks in advance for your feedback! YES!! I would love to try a week of this out! I tried to do calendar math at the beginning of the year and have gotten away from it due to time constraints and demands of my students. 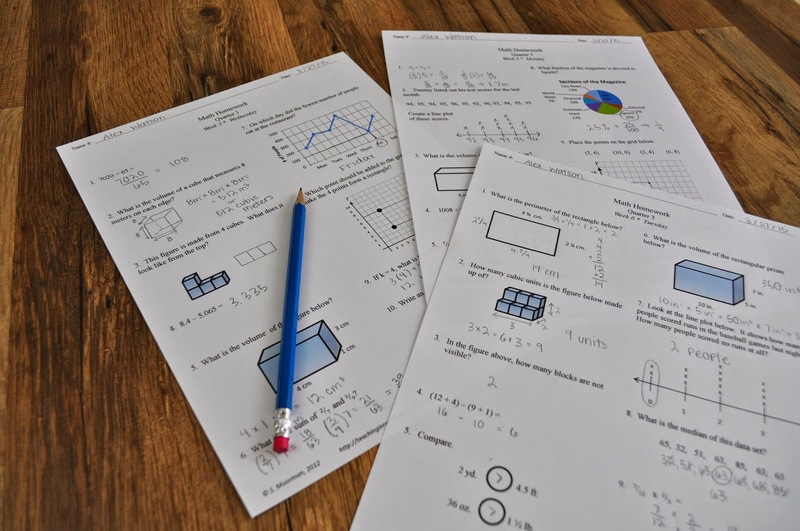 I agree with some of the comments above when you say sending home a practice sheet or page in their workbook does seem to just seem to set them in motion but do they really comprehend and do they remember what we learned earlier in the year? I want to get back to calendar math so much! I'm happy that I found your blog. I want to incorporate spiral math HW and a number of the day concept in my class, and you have both at my finger tips. Thanks! Hey, thank you for sharing. I teach 4th and 5th grade math. I currently use engageNY, but have received a lot of pushback from parents on the HW. I was thrilled to find this post, spiral HW makes so much sense. I would love to try the spiral HW and calendar math to see if it is something I can incorporate. Also, do you grade the HW? And what program do you use to type the HW? I find word frustrating when trying to use diagrams and fractions an such. This sounds like a great way to start a new year! It would definitely help to see where the students are as they enter into 5th grade. I would love a sample! I am also a new 5th grade math teacher and would like to try this! I teach 5th grade! I'm looking into starting calendar math & spiral homework! I am very interested in your spiral homework. I teach 7th grade and am looking for something different so I guess 5th grade would give me something to look at. I would love to see a week sample for 4th grade. I teach 4-8 Sped. I want to start calendar math & spiral homework for my students. I would love to try the 5th grade copy. I would love to try it... In fact, I'm doing spiral math now on their morning work where they work five problems a day. I check off the ones they miss. And the next day depending on which problem they miss, I assign them an additional practice sheet that covers that standard which they must return the next day with their homework. But I would love to see your materials as well because I have low fifth grade students who literally need to practice math in their sleep. I am a newbie to fifth grade this year! I live and teach in Southern Indiana where times are tough for us, teachers. We adopted the Indiana College and Career Readiness standards. Our school system was amidst textbook adoption when the Common Core was "thrown out" so the provided curriculum does not directly align with our standards. Resources like yours are so greatly helpful and appreciated. Thank you for sharing! I am definitely heading over to your TPT store to grab some of your math bundles soon. Math is my favorite subject but sometime i can't find answer of new exercise now your writing discussion give me good idea thanks for share it letter of intent for masters program . Hi! Do you still have 5th grade or higher available?